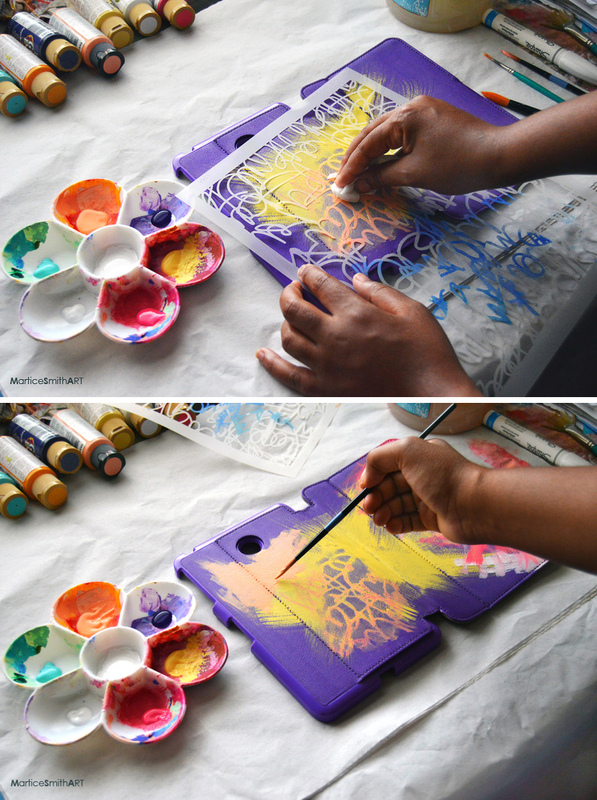 StencilGirl Talk: Guest Designer Martice Smith II: Getting Creative with Cases! 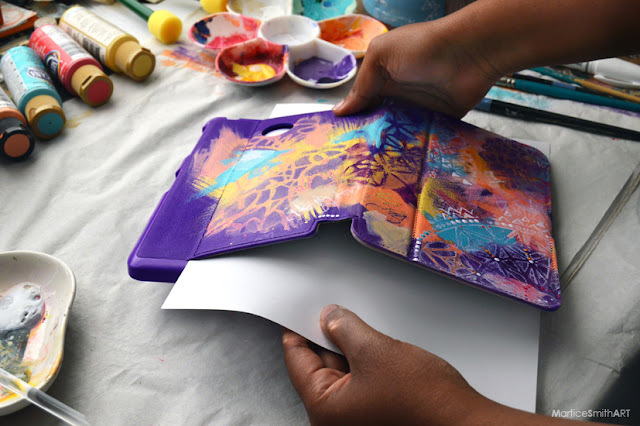 Guest Designer Martice Smith II: Getting Creative with Cases! to combine stencils and paint to create a reverse stenciling effect. You're an ARTIST! Use this "blank canvas" as an opportunity to let your gift of creativity shine! Yes, the color is in your favorite shade of violet but wouldn't you LOVE it even more if yours was customized, making you wanna break dance every time you took it out of your bag to check your email? into a wildly colorful one you won't wanna put down! 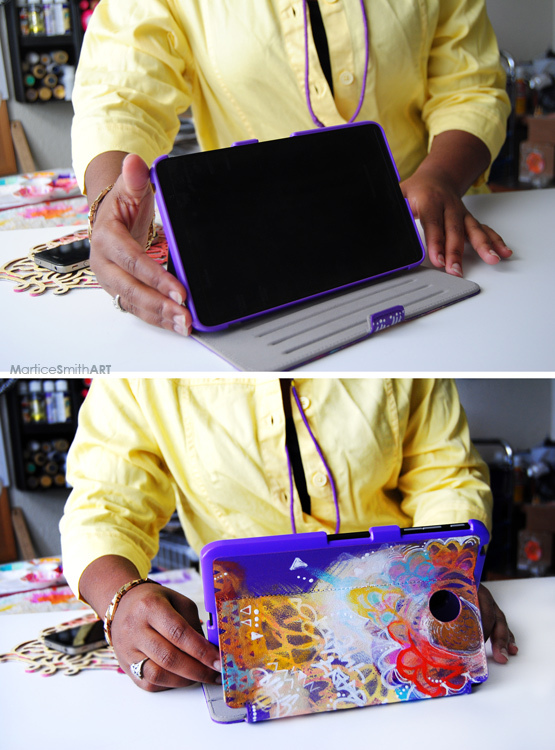 Before we dive in, let's start with a clean tablet case. Wipe the surface with a baby wipe and a dab of alcohol to remove grease stains from fingerprints and dirt. Set aside to dry. Paint Adhesion Medium keeps paint layers from rubbing off while you're painting and after the paint has dried. 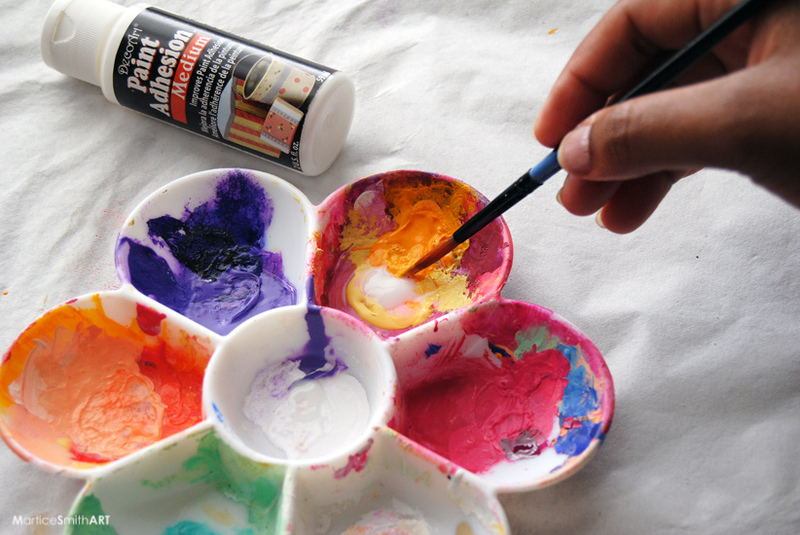 All you do is mix 50-50 with every color of acrylic paint you'll be using. The fan brush is one of my go-to brushes if I want my brushstrokes to have lots of energy and feathered edges. Here, I'm applying my first layer of paint in the color Banana Yellow. When this layer is almost dry, a second color is introduced (Peach Silk). Allow the two colors to blend for a smooth transition of color. Vary your pressure - the harder you wipe, more of the paint is removed. Light pressure from your dominant hand will spread the paint around but won't remove all of it. 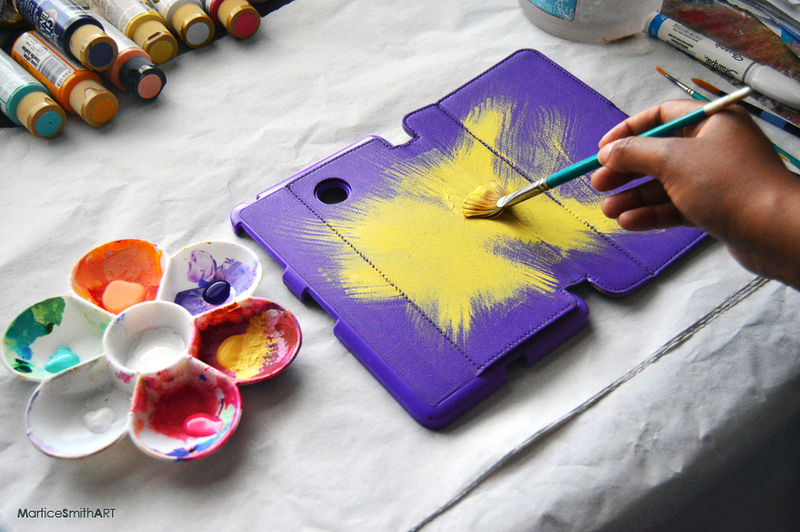 Continue designing your case with paint. Don't hold back, go for the rainbow! TIP: You don't have to use every part of your stencil. Try using certain parts of it and combine or layer parts from another stencil to create a unique design. Apply scotch tape to areas you don't want to get paint on. Alternate between a fan brush, round brush and a liner brush for adding small details. When your design is complete, allow the entire surface to dry for a few minutes. ~Dry brush over painted areas with a complementary color. I love the visual contrast of this because both colors fight for your attention! Finally, with a mixture of watered down clear gesso, apply 1 - 2 layers over the surface of the tablet case. Let dry at least an hour before handling. What's your favorite thing to customize? Martice Smith II – Illustration & Design Studio, based in Missouri and owner of Uneek Art Boutique. Martice combines traditional mixed-media + digital techniques with her love for fashion, typography and wildlife, infusing her illustrations with her bold, urban style. Follow Martice as she mentors you on how to create with an expressive, free-style spirit while developing the artistic lifestyle + biz you envision for yourself. 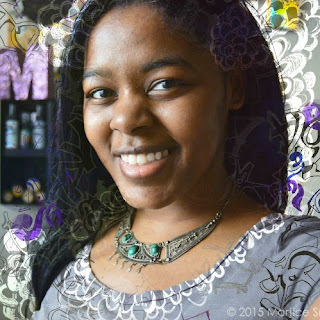 Discover more tutorials on her blog! Hi Jessica! You're welcome. Thank you so much for your comment! Wow -- love this art! 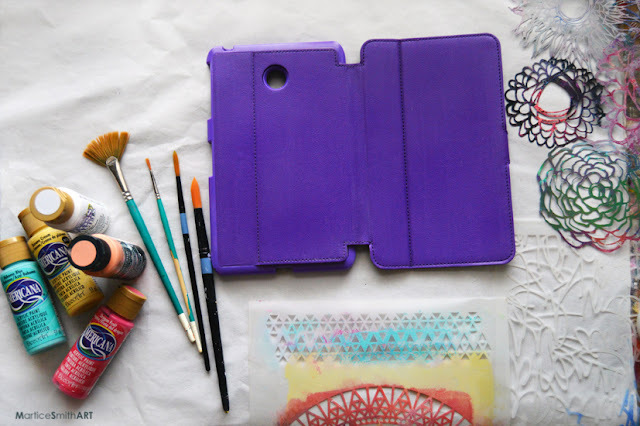 I love how your case turned out - such a great idea! 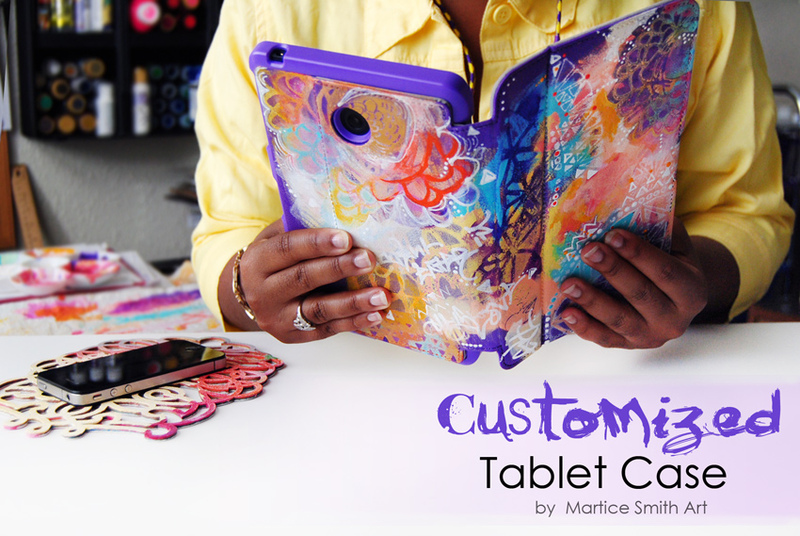 Salivating over your Tablet Case! Pretty, pretty! Also love your pretty necklace & rings that you're wearing. Loved your step by step Maurice. What a fun and lovely project!! j. What a treasure you created--amazing! Fantastic case! Thanks for the great information about products to make the work hold up to use. Excuse me, I have to go embellish something, anything! The worst thing is when somebody is threatening your family or you personally by phone, have a look at this link for more information. DIY is the thing that I always liked. Thanks for sharing this DIY. It looks great. I am defiantly going to try it.